We are the best when it comes to garden waste removal services in Camberwell. At Rubbish Removal Camberwell, we are professionals and can handle all of your waste from broken paving slabs, decking, to twigs and leaves. All across SE5, we are here to solve your garden waste clearance needs. 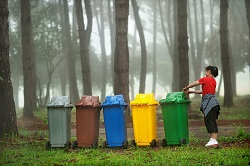 It can be amazing how vast a range of materials you find you want to dispose of from your outdoor area, so let us help. With years of experience we are on hand to help with a range of garden clearance services. For high quality services and the best prices around, call 020 3793 4008 now. Why Can We Help with Garden Waste Removal in Camberwell SE5? There are times when your garden tidy up ends up with lots of waste to clear. After a long winter it’s amazing how much rubbish a garden can generate. If you are looking for a reliable garden clearance then call us now. From sheds, fences, paving stones to weeds and leaves we can shift the entire load in one trip. Our vehicles are specially designed to take away your garden waste and dispose of it properly and in accordance with the proper guidelines. All of our services are guaranteed. Our dedicated assistants are fully capable of dealing with all of your rubbish, so reserve your appointment now. We ensure almost all of your garden waste is reused for the sake of the protection of the environment. You can trust us to do a safe Camberwell SE5 garden waste disposal anytime. Nothing is too much for us from helping with debris from construction work in your garden to patio, shed, twigs, leaves and weeds. Let us solve your problem and save you the hassle of clearing it all away. All of your garden rubbish will be reprocessed, and almost all of the gardening debris is recycled. We work all over the SE5 area now and offer some of the lowest price patio clearance services in the district. What Makes Us Stand Out From the Rest Garden Waste Removal Services in SE5? We have no minimum or maximum load, we simply take it away. You will be amazed at how efficient our workers are. For a fast and effective garden waste disposal let us help now. Our team offer same day services too so call us now on 020 3793 4008. We will divide waste materials and take them away to be reclaimed safely. Most garden waste is reusable and recyclable, which is easy to deal with for us. Why not check out our reviews and read about all of our content customers. We follow all safety regulations and will leave your garden tidy after our garden waste clearance in Camberwell. It can be hard knowing what to do with all of your garden rubbish so make sure you hire Rubbish Removal Camberwell. We are the best in and around Camberwell and have a range of garden waste removal services on offer. Our low-cost services are reliable and delivered to a high standard. We are here to help all year round. Whatever work you decide to do in the garden and it generates garden rubbish book us today on 020 3793 4008. For a fast service rendered by highly skilled experts you can rely on us. So if you need a garden junk collection within the SE5 area, call today. You will get a first class garden waste removal service in Camberwell SE5 at a good price.